Florence has of course been the scene of crime fiction already, most visibly in the Guarnaccia novels of Magdalen Nabb. Christobel Kent, who has written several novels set in Italy, takes up the mantle of the English-crimewriter-in-Florence, now that Nabb is gone, and the first of her series based on the character Sandro Cellini has just been released. Kent shares some ground (more than just the city) with Nabb, but with significant differences. Both writers focus on neighborhoods, families, and personal/domestic crimes (rather than on globalized crimes, serial killers, conspiracies, and mafia criminals, such as is the case with another writer setting his works in Florence, the Italian former policeman Michele Giuttari). Nabb's Marshall of the Carabinieri is stationed at the Pitti Palace, and this first case of Kent's Cellini hovers around the Carabinieri station at the Pitti and the neighboring Boboli Gardens (but like Guarnaccia, Cellini roams far and wide across the city in pursuit of the facts in the case). But Cellini is a private detective, a disgraced policeman (forced out by departmental politics as well as his own actions). Cellini is, however, not a hard-boiled cop (he sympathizes with victims and others rather in the way that Guarnaccia does). Kent's plot turns rather a lot on coincidence (I'm tempted to say that she treats Florence more like an English village than the city it is, tending toward "two degrees of separation") rather than on perception of character (more Nabb's technique). The narrative is divided among third-person narrations from the points of view of Cellini, his wife, Iris (a young English student whose roommate, Veronica or Ronnie, has disappeared), and occasionally a couple of other chaacters, and in the first part of the novel, the narrative tends to summarize rather than present the dialogue (later, the dialogue is more commonly presented directly, and usually to better effect). Cellini is uncertain about his new profession, and his wife is helping, even pushing him, to set up his office and develop a cleintele. His first client is an elderly woman whose husband has apparently committed suicide, but she doesn't believe he could have done so. The case becomes intertwined with the missing student (the first of the coincidences) and we get inside the private art school where both young women were studying drawing. The story moves along rather slowly, with some reference to the "Room with a View" sort of English fiction set in Florence (Iris is in a sense a traveling companion for her roommate, engaged by Ronnie's mother) as Cellini uncovers some facts and has others presented to him by characters he encounters, but the pace picks up in the last third because of a sense of urgency created around Iris and her own search for what has happened to the vivacious and troublesome Ronnie. Kent also frequently (and to good effect) uses the novelist's trick of ending a chapter just before a new fact is revealed, delaying the revelation until other elements of the story have caught up. A Time of Mourning is at the opposite end of the crime spectrum from Tobias Jones's The Salati Case, recently reviewed here: where the story and the detective in Salati Case are both hard-boiled, the detective and the story in A Time of Mourning are rather soft, more in the fashion of the cozy. Even the covers of the two books suggest the difference in content: Jones's book shows dark, narrow streets of Parma and Kent's shows a rather idealized view of the Arno (and the river does, in fact, play a specific role in the book). Both novels use their respective Italian locations effectively (though Kent is more specific about on- and off-the-beaten track sections of Florence), but the two books appeal to different tastes in crime writing. I have to say my taste generally runs more to the hard-boiled or noir, but Kent's novel is far better than the aforementioned Giuttari's Florentine fiction, in terms of the writing and the plotting, and certainly a valid pretender to Nabb's crown as queen of Florentine crime. 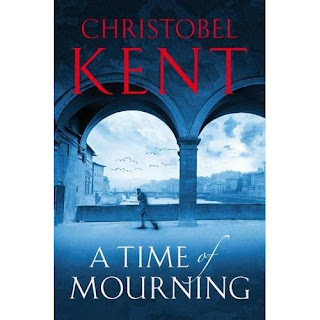 My first reading of Christobel Kent's 'A Time of Mourning' was rather rushed, but even so, I knew I would be returning to re-read it. Something I am doing at present and I would say that it deserves better critique, than given here.